What would you spend $50.00 on? Well while you are contemplating that question visit the rafflecopter form below and enter to win a $50.00 cash card from these awesome bloggers. This giveaway is part of the 12 Days of Christmas Event over at A+ Interactive Math. 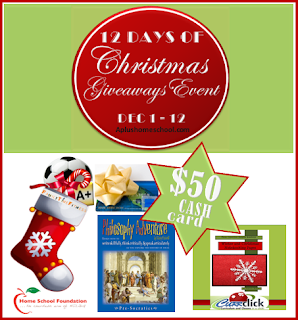 There is still plenty of time to enter the $50.00 cash card giveaway below as well as today's daily giveaway on the blog. Also don't forget to snag the freebies from each day as well (eBooks, printables and more). And if you are looking for a great math curriculum or supplemental math products be sure to check out what A+ Interactive Math has to offer. Use my special link to save 20% off already reduced prices.